The just-concluded EU Summit on migration has come up with measures like securing centers for migrants to process asylum claims, strengthening external border controls, and boosting financing for Turkey and countries in North Africa. But these are old solutions to old problems. Since 2015, the EU has been working at full capacity to overcome the migration crisis. EU member states received over 1.2 million first-time asylum applications in 2015, more than double that of the previous year. But it seems that the European continent is still working in the same old way to try to prevent the entry of immigrants and not to address the causes of migration. Even if we assume these measures bring success in reducing immigration for some time, the EU will later be surprised when migrants use other means and methods to migrate, because the causes of migration still exist. The root of migration is poverty. The African continent has suffered occupation and war for many decades. Many African countries have not yet been able to achieve the path of reform and development. This has put the people of these countries under unbearable pressure from poverty, ignorance and disease. They have pushed themselves into the abyss and tried to cross the border to reach Europe. They have faced danger and horror, believing a chance at a better future is worth dying for, if necessary. With the emergence of the new system of globalization, the world became a small village and Africans opened their eyes to the luxury and good life enjoyed by Europeans, which inspired them to move to these countries. The majority of people from African countries continue to blame European countries for their backwardness and believe they should shoulder their responsibilities toward Africa. As a result of the failure of European countries to play the role that the African people were waiting for, these masses migrated to Europe to try to gain these rights. Europe, when dealing with refugees, looks at them from a perspective of human logic or empathy and does not view migration as a symptom of a disease. European countries must change their thinking and strategy to deal with the disease in order to make the causes of migration disappear. It is time for Europe to look at the Chinese experience in Africa. The Chinese policy has always focused on development. Economic relations between Africa and China have grown enormously, especially since 2006. The African continent is playing an important role in the Belt and Road initiative. China provides infrastructure funding and a workforce, and this infrastructure allows Africa to increase its production and exports, improving the quality of life and improving the conditions of millions of Africans. Last June, in Hangzhou in Zhejiang Province, Chinese construction giant PowerChina and the Italian firm, Bonifica SpA signed a deal about a regeneration project of Lake Chad. The agreement includes carrying out feasibility studies on transferring water from River Congo in the Democratic Republic of Congo to replenish Lake Chad. Due to less rainfall and increased irrigation, the Lake’s area has shrunk from 20,000 square kilometres to just 2,000 square kilometres. Other factors, include an influx of refugees fleeing the atrocities of the Boko Haram, have contributed to increased demand. The proposed major water diversion scheme would involve channeling a small percentage of water from River Congo towards the north via a navigable canal. He also highlighted that the movement of the water could feasibly be used to create hydro-electricity, as well as boosting regional trade, creating new economic infrastructure like river ports, and making new agro-industrial zones. PowerChina, a large state-owned enterprise in China that built the Three Gorges Dam, has committed US$1.8 million to finance to research studies for the initial stages of Transaqua. The canal will effectively create a New Silk Road to Lake Chad and there are plans to have a service road and eventually a rail line run alongside the waterway, creating more infrastructure and access. This is in keeping with the values of China’s Belt and Road initiative. Wang Hao, from the Chinese Embassy in Germany speaking at the Schiller Institute’s Development of Nations Conference, explained China’s decision to put forward the Belt and Road initiative. He spoke of how China has learned from its own experience how important transport facilities are for the development of the economy. He quoted the Chinese saying: “To get rich, you must build a road first.” This is at the core of the Belt and Road initiative – infrastructure supports economy recovery and strength. He highlighted that China accounts for two-thirds of the world’s total high-speed railway, with 25,000 kilometres. This infrastructure laid “a solid foundation for the rapid development of China’s economy”. Facilities connectivity is one of the priorities of the Belt and Road initiative as China believes proper infrastructure is at the basis of economic development. This in part illuminates the reason behind China’s investment into Transaqua. Mohammed Bila of the Lake Chad Basin Commission said Africa can become the next China if it invests in the Transaqua infrastructure with the support and partnership of China and Europe. With investment so far of US$1.8 million from China and US$2.5 million from Italy, this project could “launch Africa on the road to economic growth, human security, industrialisation, peace, development and the attainment of the dreams of Pan-African leaders” such as Dr Kwame Nkrumah, former president of Ghana, who first proposed the project in 1964. Secretary Mohamed is a passionate supporter of science and technology for Kenya and for Africa. On June 16 she praised China’s role in supporting science in Africa, through a new joint center in Kenya. Her commitment is reminiscent to that of Naledi Pandor, Science and Technology Minister of South Africa, also an African woman who is an outspoken promoter of science and education for Africa. The world is on tenterhooks waiting for the next moves from the Trump Administration in terms of the draconian tariffs he has threatened to place on China as well as on a number of other countries, including our close neighbors Canada and Mexico. And the question remains for most people: Is he really intent on carrying out the threat (the first tariffs are to take effect on July 6) or is this merely an “in-your-face” negotiating tactic to cut a better deal for the United States? We probably won’t know until the last moment, but a number of things seem to be clear. Why the “Fire and Fury” on China Trade? “If the Merkel government is still in place when this article appears, there is a very good way by which the present crises can be overcome—from the migrant crisis to the government crisis and the EU crisis. Taking the example set by the Singapore Summit—that real change is possible, and that the past does not determine the future—the German government should ensure that the agenda of the European Union summit on June 28-29 be quickly changed. EU cooperation with China’s New Silk Road initiative for the development of Africa should be made the sole subject on the agenda, and [President] Xi Jinping or [Foreign Minister] Wang Yi should be invited to attend, as well as some African heads of state who are already cooperating with China. “If the EU summit, the Chinese government representative, and the African representatives then pronounce in a joint declaration the commitment to undertake a joint crash program for a pan-African infrastructure and development program, and promise all the young people of Africa that the continent will overcome poverty in a short time, such a declaration, due to the participation of China, would have all the credibility in the world in Africa, and would change the dynamic in all the countries towards definite hope for the future, and thus would immediately effect a change in the migrant crisis. It would also free the EU from its current crisis of legitimacy, and give the European nations a mission which would place the unity of Europe on a great new level. “Will the heads of state and government of Europe manage to follow the example of Trump and Kim Jong-un? The prospective of developing Africa together with China, would also give President Trump the urgently needed opportunity to overcome the otherwise looming spiral of trade war, and to balance the [U.S.] trade deficit by increasing trade, primarily through investment in joint ventures in third countries. “Transaqua is an inter-basin water project to transfer a sufficient flow of water from the tributaries of the Congo River to restore Lake Chad from its current diminutive size of 1500-2500 square kilometers to its 1963 level of 25,000 square kilometers. The Transaqua design is to create a navigable 2,400-kilometer canal that by gravity will deliver between 50 to 100 billion cubic meters of water to the Chari River in the Central African Republic, which is the primary tributary to Lake Chad. The channel will be created through a series of dams of the tributaries to the right of the Congo River. Africanagenda: Hello Mr Freeman, thank you for joining us today to discuss the Transaqua Project. You are very well informed on this subject and since 2014 have been the Vice Chairman of the Lake Chad Scientific Committee. Earlier this year you spoke in Abuja, Nigeria at the International Conference on Saving Lake Chad. Could you tell us about the sense of optimism that this project is bringing to Africans? I believe this was a dream of Ghana`s President Kwame Nkrumah, that the Sahara Desert could bloom. L. Freeman :The endorsement of the Transaqua inter-basin water transfer project at the International Conference to Save Lake Chad held in Abuja from February 26-28 was a milestone for the entire African continent. Nigerian President, Muhammadu Buhari deserves credit for initiating this conference and his support over many years to recharge Lake Chad. This project would be the largest infrastructure project in Africa connecting a dozen African nations in a super economic zone of development. 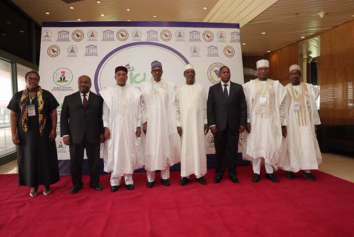 The Transaqua proposal has been known for several decades, but it was only at the Abuja conference that the Heads of States of the nations of the Lake Chad Basin Commission- (LCBC) officially decided to explore the feasibility of the inter-basin water transfer project. As a result of the conference, approximately $3.6 million will be allocated for the first ever feasibility study of Transaqua to be conducted jointly by PowerChina and Bonifica. As the news of the success of this conference held in Africa spreads, it will create a wave of optimism across the continent. One reason is that African leaders are thinking big with a vision for the future, having taken it upon themselves to discuss and support such a transformative infrastructure project. The Sahara Desert, the largest in the world-the size of the continental United States- can bloom if it has water. The loss of lake Chad, the largest body of water in the desert would be a catastrophe not just for those living in the Lake Chad Basin, but for the entire continent, and implicitly the world. Therefore, I am optimistic that the Abuja conference will be a turning point for Africa. Africanagenda: Transaqua is unique.It is it the largest engineering project ever proposed and as the largest infrastructure project in the world it has the potential to radically transform the economy of the continent`s interior, not just in terms of agriculture but through industry. Could you explain to our readers how transformative Transaqua will be? L.Freeman: The land area of all the nations that would be affected by Transaqua equals approximately one third of the African continent. The inter-basin water transfer project would create a navigable canal that would facilitate a new level of trade and commerce between the nations of the two basins: Congo River; and Lake Chad. Resulting in an increase in farming, manufacturing, fishing, electrical power, roads, and other related infrastructure. Thanks in part to China’s New Silk road, African nations are presently engaged in the most intense level of development of infrastructure, most especially in new railways that potentially could cross the continent from Djibouti to Dakar. Plus progress is being made on several East-West highways that would also connect to South-North routes crossing the Sahara Desert. The combined effect of the completion of these infrastructure projects would create an economic renaissance for Africa that portends the elimination of poverty and hunger for hundreds of millions of Africans. 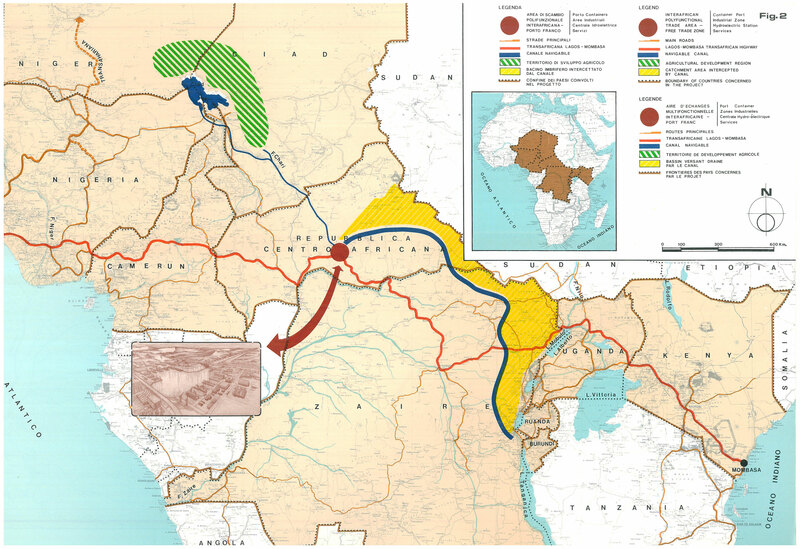 If you look at a map of Africa, you will see that Transaqua will travel northwest from the southeast corner of the Democratic Republic of the Congo through the Central African Republic, thus intersecting the East to West network of new railways and highways. The combined effect of the completion of these infrastructure projects would create an economic renaissance for Africa that portends the elimination of poverty and hunger for hundreds of millions of Africans. The Democratic Republic of Congo plans to start work this year on the frequently delayed Inga 3 hydropower project, after receiving a joint bid from two previously competing consortia of investors. One group led by China Three Gorges Corp. and another including Actividades de Construccion y Servicios SA of Spain submitted a joint bid on June 6 for the project that will produce 11,000 megawatts and is predicted to cost $13.9 billion, Bruno Kapandji, director of the Agency for the Development and Promotion of the Grand Inga Project, said at a conference Wednesday in Lubumbashi in southeast Congo. Africa’s biggest copper producer and the world’s largest source of cobalt has been considering building Inga 3 for more than a decade to address a power shortage that has curbed mining-industry growth. A treaty signed in 2013 provided for the plant to export 2,500 megawatts of power to South Africa. The plant would form part of a larger Grand Inga hydropower complex spanning part of the Congo River and produce as much as 50,000 megawatts when complete, according to the World Bank. Construction on Inga 3 will take as long as seven years, Kapandji said. Congo’s government last year asked the competing consortia to work together and submit a joint offer to build and manage Inga 3. Once a concessionaire company has been established, the developers “will commit themselves to mobilizing the funds to complete the project and operate it,” Kapandji said. The next phase of Grand Inga was initially supposed to produce 4,800 megawatts. “The project has changed because the demand has changed,” said Kapandji. The mining industry’s energy deficit has increased from about 500 megawatts to 1,300 megawatts in the intervening years since the project was conceived, he said. Editor’s note: William Jones is the Washington Bureau Chief for the Executive Intelligence Review, and Non-resident Senior Fellow of Chongyang Institute for Financial Studies, Renmin University of China. The article reflects the author’s opinion, and not necessarily the views of CGTN. The failure of the G7 to resolve the 2008 financial blowout has given the lie to the “acumen” of these seven countries in keeping the economy on an even keel. With the trillions of dollars that were spent to bail out those “too big to fail” investment bank, the “bubble” has simply gotten bigger – and more dangerous. And for most of the world, the G7 has simply been considered something of an “old boys’ club”, kept intact for the sole purpose of maintaining their positions – and that of the “moneyed interests” in power. The lame attempt at integrating Russia into the G7 “club”, at least into their political discussions, lasted only a short amount of time before it was rescinded. But the G7 no longer has the same weight it once had. The growing weight of the Asia-Pacific region, and particularly, China, has significantly reduced the clout of the G7 nations in world markets, and in world affairs. And the sorry state of the European economy, with the Brexit and the crisis in Italy, has critically undermined the “European factor” in the G7. WaPo Warns of “Mother of All Credit Bubbles:” Who’s Listening? June 12, 2018—An extraordinary article by regular financial columnist Steven Pearlstein in the June 10 Washington Post warned that a surge in corporate debt has created “the mother of all credit bubbles,” and put the U.S. (and world) financial systems on the road to a new crash worse than that of 2007-8. The full-page spread featured charts showing that corporate debt, much of which is being used for stock buybacks, is increasingly risky, and that it is at record highs. Pearlstein adds that one in five companies have debt obligations exceeding their cash flow—i.e., they are zombies just waiting to die. Much of what Pearlstein reports is not new to readers of more reliable financial reporters, such as Nomi Prins, Pam and Russ Martens, and others. This blog has reported on previous warnings by the U.S. Treasury’s Office of Financial Research, which Pearlstein mentions, and by former FDIC officials Thomas Hoenig and Sheila Bair. Pearlstein also does not stress, for example, the link between the new shaky mountain of debt, and the major banks, which are intimately connected to the so-called “non-bank lenders” involved in the current bubbles. How to reverse this process? We need the policies that do the opposite: that promote growth in productivity (credit for a revolutionized infrastructure and scientific frontiers), and convert debt into equity—specifically in the way that Alexander Hamilton transformed the debt of the fledgling United States into capital for the First National Bank. After taking away the rewards and incentives for speculative borrowing (by re-imposing Glass-Steagall), we need a new National Bank for Infrastructure into which certain categories of solid debt (such as Treasury and municipal bonds) can be traded in for capital stock, which will serve as the foundation for an investment boom in the real economy.